The optional ME-RC remote control is simple to use, yet allows all the set-up features of the ME, MS, MS-ME, and RD Series inverters. The ME-RC controls the ME-AGS automatic generator start using a network connection to the inverter. This remote has convenient finger-tip operation, including one-knob programming. The new ME-ARC advanced remote offers even more control of the setup. 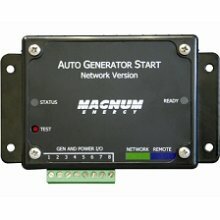 The optional Auto Generator Start (AGS) module automatically starts and stops most major generator brands. The generator can automatically start based on low battery voltage or on the inside temperature, starting a generator to run an air conditioner when the temperature of an RV or cabin rises to a user-settable level. The ME-AGS-S is the 'standalone' version of Magnum Energy's Automatic Generator Start (AGS) controllers, and can be used in power systems that don't have a Magnum inverter. The ME-AGS-N is the 'network' version of Magnum Energy's Automatic Generator Start (AGS) controllers and is setup and operated via a Magnum Energy Inverter and ME-RC or ME-ARC remote panel. When using the ME-RC Remote, the ME-AGS-N has basic adjustments starting on battery voltage or temperature. When using the ME-ARC remote, the ME-AGS-N has advanced start and stop settings based on: Time of day, Battery State of Charge, battery voltage, high temperature, or inverter load amps. Also includes the ability to manually turn the generator ON and off, generator exercise, warm-up and cool-down. The optional ME-SSI allows series connection of two MS4024 inverters for 120/240VAc split-phase output at 8kW total power output. ME-BMK monitors battery percentage state-of-charge (SOC), along with amps, voltage, amp hours and min/max DC volts, and then provides this information in an easy-to-understand display via the ME-RC or ME-ARC remotes. Kit includes a sense module, shunt and wiring. The MM-RC provides on/off control and a quick indication of inverter and charger operation.